SportsLine's advanced computer model simulated Mets vs. Braves on Sunday evening 10,000 times. The 2019 MLB season is off and running and the New York Mets and Atlanta Braves are hoping to be factors in the NL East race. So an early four-game series takes on more importance than your average April meeting. They'll face off on Sunday Night Baseball, with first pitch from SunTrust Park set for 7:05 p.m. ET. The Mets took the first two games, but the Braves responded with a win on Saturday to set themselves up with a chance to split. However, to do it, Julio Teheran and the Braves will have to slip past Mets ace Jacob deGrom. New York is a -162 favorite, with the over-under total for runs scored at 8.5 in the latest Mets vs. Braves odds. Before you make any Sunday Night Baseball MLB predictions, listen to the Mets vs. Braves picks from the advanced computer model at SportsLine. The model, which simulates every game 10,000 times, has raked in the winnings for those following its picks and is off to a profitable start on its MLB money line picks this season. The model entered Week 3 of the season on a strong 19-11 run on all MLB selections, and anyone who has followed it is in the black. Now, the model has locked in on Mets vs. Braves. We can tell you it's leaning over, and it also says one side of the money line has all the value, making it a must-back. That pick is only available at SportsLine. The model knows that having deGrom going on Sunday is a major advantage for the Mets, a big reason why New York is favored on the road on Sunday. However, given that deGrom has been a known commodity, winning the 2018 NL Cy Young Award, you could argue that Pete Alonso's performance has been the most important element to New York's 9-5 start this season. 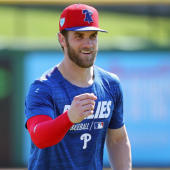 The 24-year-old rookie led the minor leagues in home runs last season and is off to a torrid start in the Major Leagues. Alonso is slashing .360/.439/.860 with six homes runs, seven doubles and 17 RBIs through 14 games this season. If he can stay hot, he capable of almost single-handily providing all the offense New York might need with deGrom on the mound. But just because New York has deGrom doesn't guarantee it's the best value on the Mets vs. Braves money line. The Braves have been getting integral contributions offensively from two young stars they're hoping to build around. Ronald Acuna Jr. and Dansby Swanson are both tearing the cover off the ball, which has helped them overcome inconsistency from their talented young pitching staff to get to 8-6. Acuna was the NL Rookie of the Year a season ago and is slashing .300/.417/.660 so far this season with five home runs and 12 RBIs in 14 games. He's riding a streak of five consecutive multi-hit games into Sunday and has the explosive offensive talent to take over a game. Meanwhile, Swanson was a former No. 1 overall pick and boasts a 1.015 OPS and 18 RBIs in 14 games. So who wins Braves vs. Mets? And which side of the money line has all the value? Visit SportsLine right now to see which side of the Braves vs. Mets money line has all the value Sunday, all from the advanced model on a strong 19-11 run on MLB picks.